EDINBURGH tram inquiry chairman Lord Hardie issued a deadline to the city council over potential conflicts of interest at yesterday’s first hearing into the fiasco. The former judge opened the long-awaited preliminary session by announcing that his officials were now grappling with six million project documents - up from the previous 5m. These are being sifted using special software from an estimated original 500 million items related to the project’s delays and cost overruns. The eight-mile line between Edinburgh Airport and York Place in the city centre, which opened last year, was also a fraction of that originally planned. Lord Hardie could not say when the first witnesses would be called to give evidence. He said: “The technology is there to assist but there are still vast numbers of document that have to be reviewed and analysed by members of the team. Lord Hardie also named seven “core participants” who will play a central role in the inquiry, which will look at why the £776 million project was completed three years late and millions of pounds over budget. 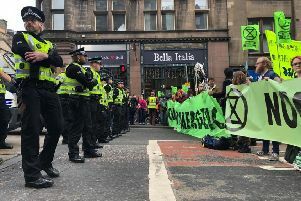 They are the council, building contractors Bilfinger Berger and Siemens, utility diversion firm Carillion, designers Parsons Brinckerhoff, law firm DLA Piper, which represented various parties, and Scottish ministers. The council’s tram development firm Tie (the former Transport Initiatives Edinburgh), which was at the heart of the project, will not be among them, with the council representing it at the inquiry. However, Lord Hardie said there appeared to be “clear scope for a conflict of interest” between the council and Tie because Tie was suing its former solicitors, and the council was suing Tie, in separate cases at the Court of Session. During the two-hour hearing, he questioned whether councillors had been aware of this when they agreed in August to Tie not being represented separately. Lord Hardie set a deadline of 27 November for the council to set out any potential conflict of interests. Other core participants will have to do the same. Council chief executive Andrew Kerr said after the hearing: “In August, the council decided it was not willing to fund the revival of Tie to take part as a core participant in the inquiry, and this still stands. The council said Tie was “dormant”, with council finance director Hugh Dunn its sole remaining director, which was a legal requirement of the company still existing. The hearing was postponed from August because Lord Hardie was ill, and comes 16 months after the inquiry was announced by the Scottish Government.